In Nogent, France, there are still scissor artists who make very fine scissors by hand, and each pair is a work of art. These scissors are exquisitely fine, wrought with intricate, decorative handles. They are, from what I’ve heard from those who own them, sharp, delicate, beautiful, and perfectly functional. Here in the States, The French Needle carries a wide selection of these hand-made masterpieces. Although I long to touch them and try them, I never have. They are a bit beyond my buy-them-to-try-them budget. I know you’re thinking I’m silly for mentioning it, because it decreases my chances of winning the things…but, in good conscience, I couldn’t really let you miss the opportunity, could I? The give-away details are on their home page. It’s for subscribers to the French Needle newsletter, which comes out once a month. You have until October 13 to sign up for their newsletter. If you scroll to the end of The French Needle home page, you’ll find the subscription form in the lower right. I would just love for one of you to win them – go sign up! In the meantime, I’m working on several stitch tutorials today. I have a list of interesting stitch combinations I’ve been playing with, and I can’t wait to share them with you – I think you’ll like them. I took some photos of some new threads the other day, so I’ll show those to you this week, too, along with a book review for a pretty neat book that focuses on a unique stitching style. And then there’s the hummingbird tail… Lots coming up! Stay tuned! You are an invaluable source of information on embroidery. I like to learn reading your newsletter and your blog and looking at the tutorials. I am already a subscriber of French needle, thanks to your blog. Oh I do love scissors and they are beautiful scissors and what a lovely give away from The French Needle. I’m so glad you are a scissor collector as this gives us your devoted readers an opportunity to try those scissors that you recommend because I value your opinion. I can’t wait for the new stitch tutorials and the combinations and for the new threads review, I wonder what new delights we will see on the hummingbird tail can’t wait. I certainly will stay tuned and thanks for letting us know about the give away from The French Needle I hope you win Mary you deserve to. Oh, wow! 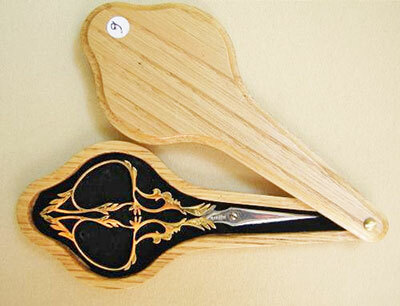 Not only are the scissors beautiful, but the wooden case is as well! Drool. It’s funny you mentioned scissors. When my mom passed away, I inherited her sewing machine and all the goodies in it. In that sewing machine she kept a pair of scissors that I loved that had the shape of a cross in it. When I went to retrieve the sewing machine, the scissors was the first thing I looked for and I was heartbroken when I couldn’t find them. I was recently searching for something else and there they were – tucked away in a different spot! I am so glad you posted this little post about the scissors. I can see what you mean by not being able to afford them. My jaw dropped when I saw the price, but I would still like to enter the drawing for them. Thanks for all that you do! I truly appreciate your knowledge and site! – Karen M.
It would be lovely to win the scissors, but I am so grateful to you for brining this site to my attention. Such a lot of really wonderful things. I love all things Sajou! I was never hugely interested in the various types of needlework accessories – a small pair of scissors and some utilitarian needles were good enough for me. Through reading your blog I’ve learned to appreciate the finer tools and am slowly trying to add to my collection. These scissors would definitely be ones that would be fondled more than they would be used!! Oh, my! What beautiful scissors and the cross stitch patterns certainly caught my eye. I fell in love with the pattern for the alphabet with the sewing theme surrounding them. It may be on my Christmas wish list. I appreciate how you introduce me to new things. Granted not are my cup of tea, yet I enjoy seeing the variety of items. I hope I get a new wall hanging for my sewing room after being teased. Oh, those scissors are gorgeous! I’m drooling now. Keeping my fingers crossed for you(and for myself if it turns out the giveaway is international because I so want that now that you had to show me such eye candy)! May you have better luck than me, Mary! Good Afternoon, Mrs. Corbet! Oh, what a wonderful week you have planned for us! I’m not entering for the scissors because I think that pair of “Storks” from the UK might be coming my way as a gift! (At least I think) but because I am an eager student, I’ve taken some inspiration from you and bought a coloring book from which to stitch a design! The “Art Nouveau Animal Designs” from Creative Haven. There’s actually Kangaroos! I think you might like to look at it for the fishy designs, because I know you like them! I also had a mini-thread hall today so I am a happy girl! Have a great day. Can’t wait for all the yummy stuff coming this week! Those scissors look so thin and delicate. So Pretty. I love looking at the French Needle website although I have never actually bought anything. But with this incentive I have signed up for the newsletter, crossed everything I can, and am hoping like mad. Those scissors are to die for gorgeous. Thank you, yet again, for giving us this opportunity. BTW how are your Sheffield scissors behaving? Hi Mary….I saw these scissors on someone else’s blog and although lovely 590.00 for a pair….seems rather out of my reach…and i love scissors..dovo are my fav……do you really think they will be giving a pair away? I always look forward to what you are stitching next…you are such an inspiration to us all..
Mary, It would be lovely to win the scissors. The scissors are elegant and the wooden box is delightful. I would first admire the scissors and the case and then enjoy using the scissors in what I can only imagine would be a smooth and sharp cut. Chances of winning are slim but I can dream. I would love to receive your newsletter. Thanks. Next Next post: When Do You Use an Eraser with Embroidery?